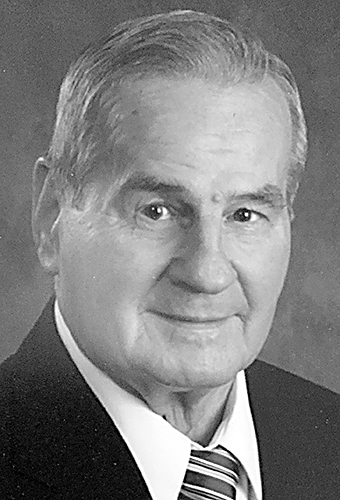 Donald J. Bowen, an inductee to the New Cumberland Hall of Fame, was ingrained in the community for 83 years. He was a talented athlete at new Cumberland High School and served with the U.S. Army. Don contributed generously to organizations and individuals in town as the proud owner and operator of Bowen’s Service Station. He was a man of few words with a big heart. Don was preceded in death by his parents, Andrew and Helen, sister, Helen and wife, Naomi “Bing.” He is survived by sisters, Mary Agnes and Dorothy Uker, brother, William C. (Marian), daughter, Pam Smith (Darwin), granddaughters, Lindsay Vulgamore (Adam), Kara Mumford (Carl), great-granddaughter (Maci) and caregiver Marcia Sipe. A celebration of life will be held on Saturday, Feb. 9 at 10 a.m. at The Immaculate Conception Catholic Church with Fr. Jeeson Stephan as celebrant. Interment will follow in the New Cumberland Cemetery. Visitation at Turley funeral home is in New Cumberland on Friday from 2-4 p.m. and 6-8 p.m.
Memorial contributions can be made to the Magic Tree Community Garden at P.O. Box 108, New Cumberland, WV 26047.